The following volunteering opportunities are available from November 2018, after our sanctuary has opened to the public. Assisting visitors at the environmental theatre. No specific qualifications are required to volunteer at our sanctuary. The only requirements are that you can speak English, have a genuine interest in primates and other wildlife and are willing to get involved. When you volunteer at Monkeyland-KZN, you pay only for your accommodation package. You can find more information about what's included on our Volunteer Accommodation page. Monkeyland-KZN funds itself through revenues from visitors who take educational tours in our forest, which is home to a variety of of primate species who roam freely through our 23-hectare forest sanctuary. 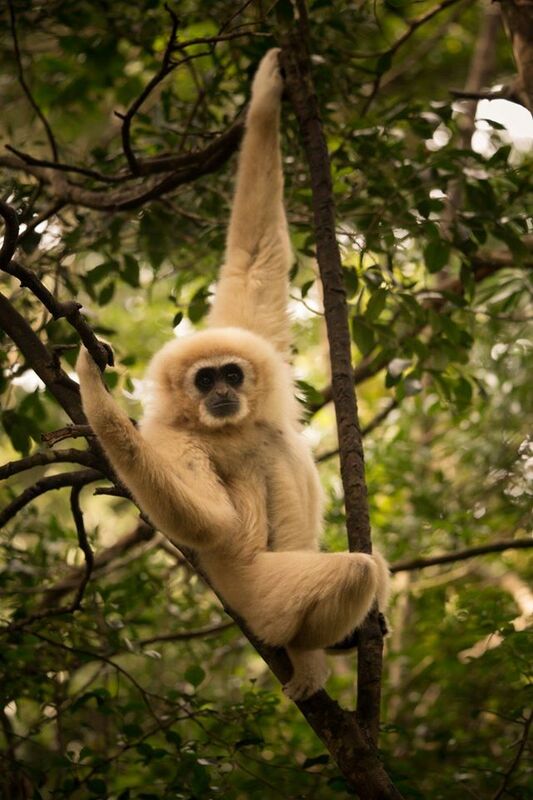 The tours are for one hour and leave our visitors with general primate knowledge, information about each of the primate species in our sanctuary and an understanding that primates do not make good pets but are happier in the trees, forests and wild habitats with peers of their own species. You will conduct tours in English and/or your own language. Volunteers wanting to work as rangers/guides must stay for a minimum of 4 weeks to ensure there is enough time for them to be fully trained. We are keen to compile a comprehensive catalogue of all of the primates at Monkeyland-KZN. Compiling and typing up this information, along with taking photographs and film footage (for YouTube and for our archives) of individual primates is an important and big project. Volunteers would need to bring their own photographic/filming equipment and laptop as we don't have such equipment at the sanctuary. As this is such a large project, it would only suit volunteers who are staying for 12 weeks. producing films for marketing purposes. The South African Animal Sanctuary Alliance (SAASA) is the sole custodian of all the primates at Monkeyland-KZN as well as all of the animals at our sister sanctuaries in Plettenberg Bay. SAASA is constituted under Section 21 of the Companies Act as a non-profit organisation and actively works towards providing primates and other rescued animals with a better and more natural life. SAASA is also involved in educational and environmental projects such as the Bushmeat Crisis Africa. The most vital SAASA project at present is our Special Monkey Home in Plettenberg Bay which is for primates who are disabled, orphaned, elderly or blind and are unable to live happily in the Monkeyland forest. We also welcome disabled primates from other locations in South Africa and countries abroad to come and live out their lives with us. The relocation of primates from various locations around the world to Monkeyland-KZN is another ongoing and costly activity. There is much ongoing and new work to be done so that we can continue to provide a safe forever home for these primates. However, all of this costs an awful lot of money. We don't currently have anybody within SAASA with the skills and experience of fundraising or grant proposal writing which is needed to generate the necessary funding. There is a whole bunch of equipment that needs servicing and regular fixing at our offices as well as the ongoing development and enhancing of our websites, so if you have extensive working knowledge of computers but wish to live in a beautiful natural environment with a chance to help out on outdoor projeects whenever computers and time allow, then this is the perfect place for you. Currently our Marketing Manager in Plettenber Bay handles most of our website updates and our Social Media Manager in Plettenberg Bay handles the SAASA page. Together with our Monkeyland-KZN Volunteer Coordinator, they handle the Facebook, Twitter, FlickR and Instagram accounts but a bit of extra help would be more than welcome. We also need someone to assist with other media and social networks, such as TripAdvisor, MySpace, YouTube, Wikipedia, Wikitravel, Blogs, LinkedIn etc. Monkeyland-KZN, like all of our sanctuaries, relies on visitor interest to fund itself. Therefore, public relations and marketing are extremely important for raising awareness of our projects. Stories can be written about our primates from a myriad of different angles for a huge variety of readerships and publications. The position would be ideal for a wildlife and/or travel journalist or blogger who would like to gain experience in writing and being published in different sorts of publications, writing press releases (e.g. when new primates arrive at the sanctuary or are released into the forest), encouraging professional journalists to write about us, taking journalists on special tours of the sanctuary etc. Monkeyland-KZN takes a very modern approach to publicity and we try hard to balance out entertainment and education to reach as many people as possible in our quest to educate the general public about the plight of primates and other wildlife. Although we are extremely happy with the skills and enthusiasm of our local vets, there is no on-site vet and the rangers and curator must often tackle medical issues themselves. Regular monitoring of the health of our primtes could be a full-time task, especially when you consider that they all roam freely in the forest! Since we advocate leaving the animals in their free-roaming environment as much as possible, medical intervention would only occassionally be necessary. Therefore, any applicant for this position must also be happy to fulfil other tasks, such as guided tours. Our volunteer vet must be experienced and able to work closely with our local vets, which will be a highly enjoyable and educational experience. Volunteer carpenters, gardeners, electricians, plumbers, painters etc. are always welcome as there's always lots to do. Email our Volunteer Coordinator, for more information or to check availability. Or simply download and complete the application form below and email it to us at volunteer@monkeylandkzn.co.za.